First, before I get to this month's question, let me point out the obvious. This is not the first Wednesday of the month. 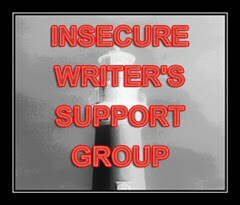 The Insecure Writer's Support Group meets the first Wednesday of every month. I've been participating for at least a year now so I know how this works. I knew what this months question was and I was ready to answer it this Wednesday. But... this Wednesday won't be the first Wednesday of the month. How I missed last Wednesday, especially since it was February 1, I really don't know. I used to feel like I had to finish a book even if I didn't like it. Almost like leaving a book half read was a sin or something. I have no idea where that belief came from, but it led to forcing myself to read some very forgettable works of literature. As I have grown in my writing, I realize if something doesn't speak to me, it is OK to put it down. Part of it is I'm older and busier and just don't have the time anymore. Part of it is I get annoyed by bad writing. Especially bad editing! If the author didn't take the time to publish her best work, why should I take the time to read it? And if it is her best work, well congratulations for having the courage to get your writing out there to the world. That's something not many other people can do. You should be proud. Unfortunately, this piece just isn't for me. And that's OK. Because I also write books, blog posts, and magazine articles that not everybody enjoys. You have permission to read what I write. And if you don't like it, thank you for at least clicking here and I hope you will give me another chance. I've missed a Wednesday before. It's frustrating, huh? We really did have similar reactions to the question. I agree that tie is just too valuable to waste on poorly-written books. We really did have similar reactions to the question. I agree that time is just too valuable to waste on poorly-written books.